Approx 18" long, pendant 2" x 1"
This beautiful piece of apple green color jade is cut in the shape of a chop. In China, chops have been used for 25 centuries by important people to put a stamp or signature on a document. The bottom of the chop was engraved with the signature. The stamp was then pressed on an ink pad and then pressed on paper. On top of the “chop” was usually an animal of the zodiac that had some meaning to the owner. 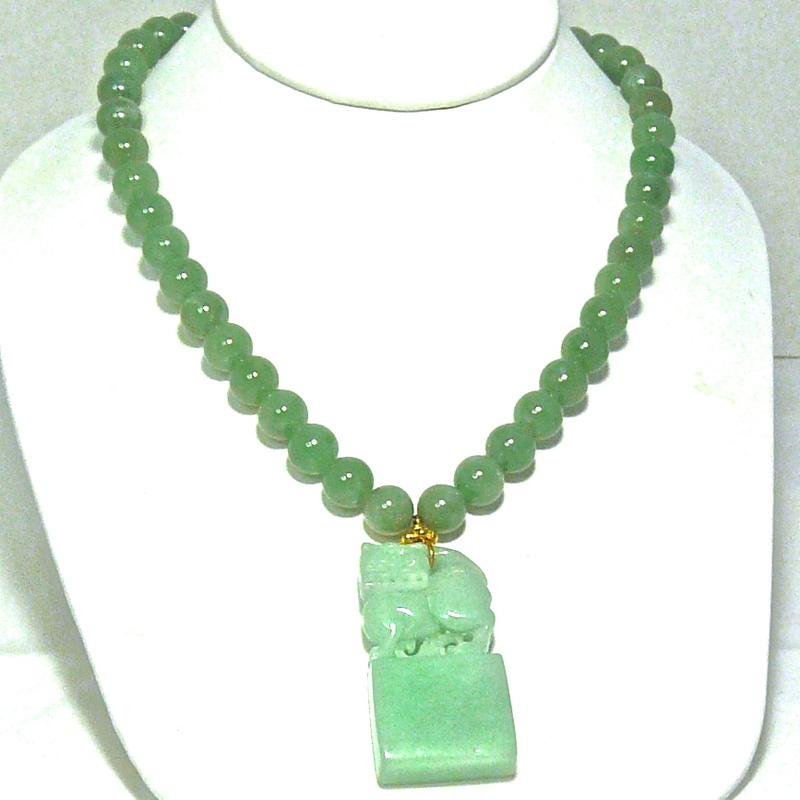 In this case, cut from a single piece of jade, is the chop with a fo dog on the top. I have beaded it with 9 mm green jade beads of a slightly darker color to show off the chop and have finished t with a 18k gold vermeil hook clasp. The design is elegant and can be worn with many things. The fo dog is the guardians of the many temples and shrines in the Orient and are often displayed in pairs. The dog is regarded as a faithful companion and is, therefore symbolic of friendship and loyalty. . It is believed that if a strange dog comes and stays with you it is a good sign, indicating riches in your future. Carrying an amulet of a dog is believed to protect one from thieves, evil spirits and disease.